Administrator or owner of the Windows and Windows Server computer can set and create a logon message text that will be displayed or prompted on screen whenever a user login to his or her user account. The configuration of log on message is useful to show or pop up a warning or notification dialog to all users who are attempting to log in to the system, probably about computer usage policy, security policy, legal statements, welcome message and etc. In addition, it’s also possible to display failure message to let users know that valid user name and password required or unsuccessful logon attempts will be logged to prevent hackers. As such, the feature is especially useful for corporations, enterprises and businesses who want to prominently display notice or reminder to end users, such as to warn users about the ramifications of misusing company information or to warn them that their actions may be audited. By default, there is no logon message title and no logon message text configured in Windows. Follow the tutorial to set up one. The feature is supported in all versions of Windows and Windows Server, including but not limited to Windows XP, Windows Vista, Windows 7, Windows 8, Windows 8.1, Windows 10, Windows Server 2003, Windows Server 2008, Windows Server 2008 R2, Windows Server 2012, Windows Server 2012 R2, Windows Server 2016 and later. In Windows 7, Windows Vista, Windows XP or older and their server equivalent, click on the Start button, then go to Control Panel. In Windows 8, Windows 8.1, Windows 10 or later and their server equivalent, open WinX Power Users menu, and select Control Panel. Go to System and Maintenance -> Administrative Tools. Open either Local Security Policy. 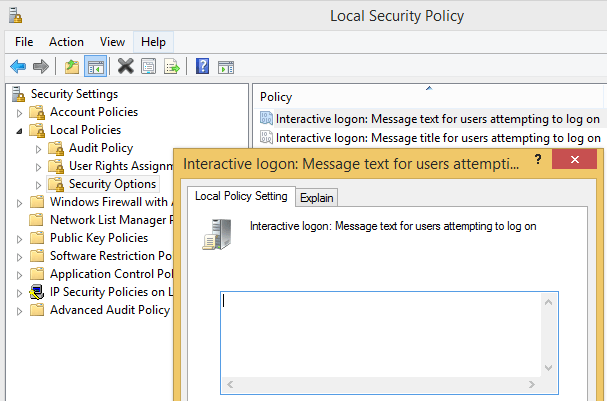 In Local Security Policy console window, expand Security Settings -> Local Policies. In the details pane on the right, locate the Interactive Logon: Message text for users attempting to log on. Right click on the security option and select Properties, or simply double click on the security option. Type in the message text to be prompt on logon. Click OK (not yet if you want to set message title as well). Follow all above steps, until to the point when you locate the setting for message text. For message title, locate Interactive Logon: Message Title for users attempting to log on instead. Type in a message title. The same configuration options are also available via Local Group Policy Editor or AD Domain Group Policy Editor (GPedit.msc). In Group Policy Editor, the settings are located in: Computer Configuration -> Windows Settings -> Security Settings -> Security Options. Note that not all editions of Windows has Group Policy Editor, especially editions meant for home users.